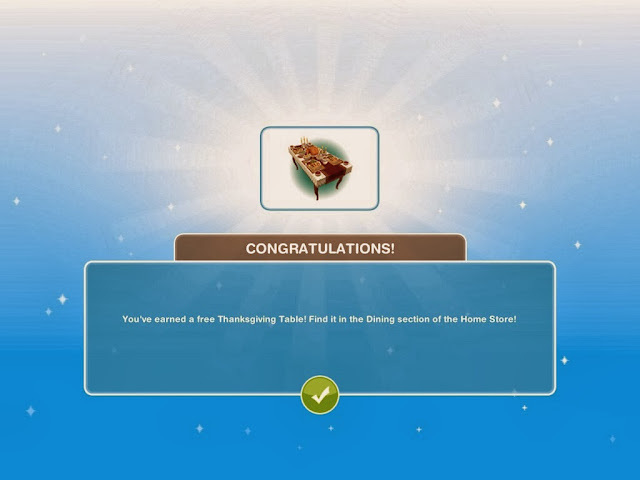 A Sim Town Thanksgiving quest is the first quest of The Sims FreePlay Holiday. You need to complete this quest to unlock limited-edition Turkey Pack. The goals are easy to do. Once you complete this quest, you will earn 3 rewards. There are 4 goals you need to complete to unlock the Thanksgiving Pilgrim Hats. Thanksgiving is upon us! It's turkey time! Get 3 Sims in the same house. Let's get this party started! Ah, they're here! It's time to greet the guests to Thanksgiving Dinner! Be nice to a Sim. You's going to need aome food! Who doesn't love Pumpkin Pie? Bake one on the stove while your guests start the celebrations. Delicious! While it cools down in the fridge, your Sims should get comfortable and watch the Thanksgiving Day Parade on TV! There are 2 goals you need to complete to earn a free Thanksgiving Table. Did somebody let off some gas? Pe-ew, it smells! Get revenge! Get your Sim to be funny to another Sim. Hang on - the turkey IS in the oven, right? It's not? You better get baking then! Cook the turkey in the oven. You need to complete 2 following goals to unlock the Turkey Beanbag & Turkey Hat. Great! It's time get your Sims sit down and enjoy a Thanksgiving meal together! Get 3 Sims to eat a Thanksgiving meal. Note: To eat a Thanksgiving Day meal, you must first buy the Thanksgiving Day Table from the Dining Room section of the Home Store. Oh, your Sims are stuffed, just like the Turkey! It's time to dance off those calories. Get 3 Sims to listen to the stereo! Interesting games to play and I look forward to work on that games.